Arriving and onward travel plans from Phi Phi all originate from a town called Phuket, which is about 45 minutes away. When you arrive in this town's international airport, you are able to take a ferry, longtail boat or speed boat to the Phi Phi Islands. When you leave the island, the modes of transportation back to the airport are the same. From the International Airport, travelers can take advantage of many different onward travel options. Arriving from the Phi Phi Islands to this international airport literally puts you at the doorway to traveling to many other wonderful, exciting and exotic laces. Just outside of the Phi Phi Islands, Phuket International Airport (HKT) has thousands of passengers arriving daily from every imaginable place in the world to enjoy the Phi Phi Island on to fulfill their onward travel plans from the Phi Phi Islands. The airport plays a key role in promoting tourism in the southern region as well as places throughout Europe. It caters to 10 airlines, more than three million passengers, over 20,000 flights and over 12,000 tons of cargo. The terminal operates daily and travel time to Bangkok, for example, is around 1 hour, 20 minutes. 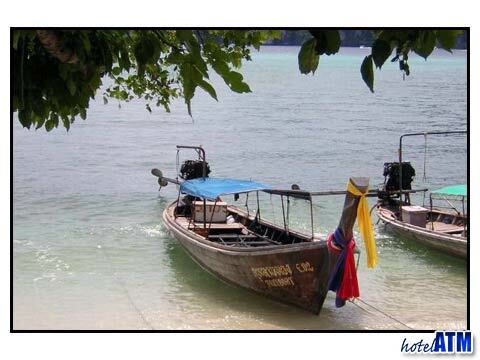 Once off the Phi Phi Island, onward travel plans to Bangkok can also be facilitated by bus if you do not prefer flying. The bus connection is, in fact, the only way to travel on land, because there is no train service available and the only connection to the town of Phuket by land is a 1200 meter long causeway that is used by cars and buses. The downside of onward travel plans from Phi Phi Island by bus is that is takes more than 14 hours to get to Bangkok. It is also possible to make onward travel plans from Phi Phi Island via cruise ship.